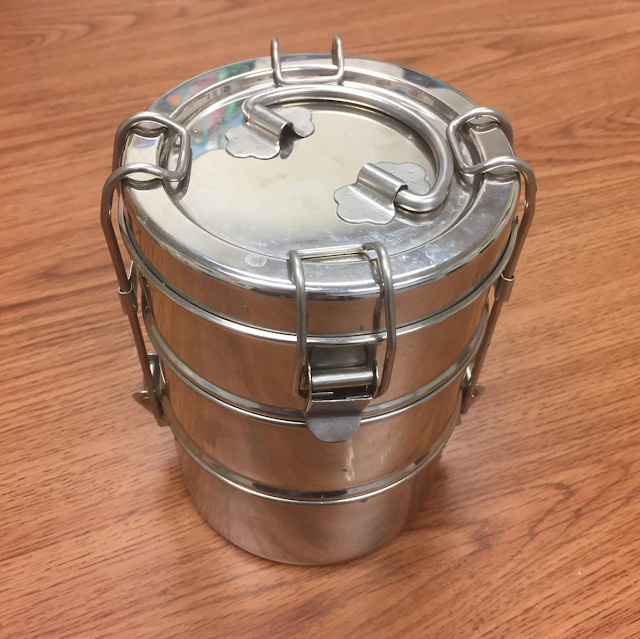 Have you ever heard of a Tiffin Lunch Box? I have, but only because I've had one for awhile. Prior to having it, I had never heard of one. It's a lunch box that is all different sections, that goes into 1 piece. I wanted to take a picture as soon as I popped it open. I haven't used my Tiffin in awhile. Usually I have one hot dish to warm up. There was one guy eating with me at work. He's not a social media guy at all. He wouldn't understand me taking a picture of my lunch. It is kind of strange when you think about it. I waited to photograph my lunch when the anti social media guy left. Homemade Beer Bread- I've been making it a lot since my allergies don't like when I drink. Travis has done stupid things while drinking, so he doesn't drink anymore. We had so much alcohol left over from New Years. It's good beer too. I wish I could drink it! Fruit and Veggies- A clementine, which is such a great proportion of fruit for one person, 3 radishes, and 3 celery strips. Quinoa Salad- That section of Tiffin was full of that when I started my meal. I don't usually like Quinoa that much, but I do in this salad. - Recipe here. I made the salad for this weekends birthdays: My Dad and Nephew Elijah. The recipe is great for a lot of people. We were missing 5 of our usual people. Lots left over. I like that Quinoa is a protein. It tastes like a grain, but it isn't one. I always like eating out of my Tiffin Lunch Box. 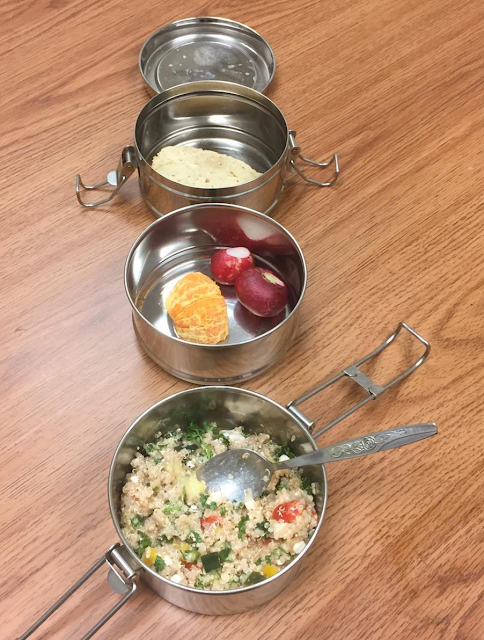 The Tiffin Lunch Box does remind me of an art supply. The art supply is a Metal Brush Washer. It took me forever to find that online! I had an instructor call it a Water Well. It's not that! I searched, "Water Well, Art Supply" - only actual water wells came up. I searched, "Tiffin, Art Supply" - only lunch boxes came up. I thought for sure it would have an actual name. Nope! Metal Brush Washer it is. That cup looking thing with the holes goes into the washer upside down. Then you can get your brush clean, and the paint yuck water sinks to the bottom. The lid clips on to make it easy to travel with. It is super handy. Do you think the Metal Brush Washer looks like the Tiffin? Quinoa is a protein?!?! I so didn't know that! We usually have it mixed in with rice for dinner. I've never had a quinoa salad; I'll have to check out your recipe. Is it easy to open and close? Like for a 2nd grader?